When I was installing SharePoint 2010 on my Windows 7 machine, I ran into few issues, even though I installed all of its prerequisites that it says to install. Here are those issues and the solutions worked out for me. Issue 1: An exception of type System.IO.FileNotFoundException was thrown. Additional exception information: Could not load file or assembly ‘Microsoft.IdentityModel, Version 3.5.0.0, Culture=neutral, PublicKeyToken=31bf3856ad364e35′ or one of its dependencies. 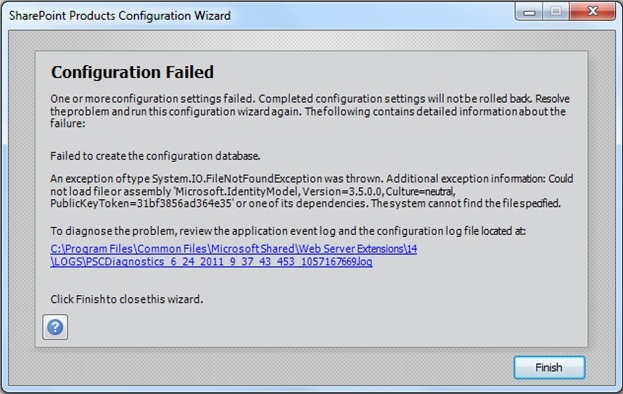 The system cannot find the file specified. Here the problem is that the Windows Identity Foundation is not installed on the machine. Windows Identity Foundation can be downloaded from here. 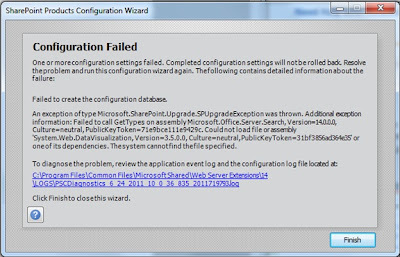 An exception of type Microsoft.SharePoint.Upgrade.SPUpgradeException was thrown. 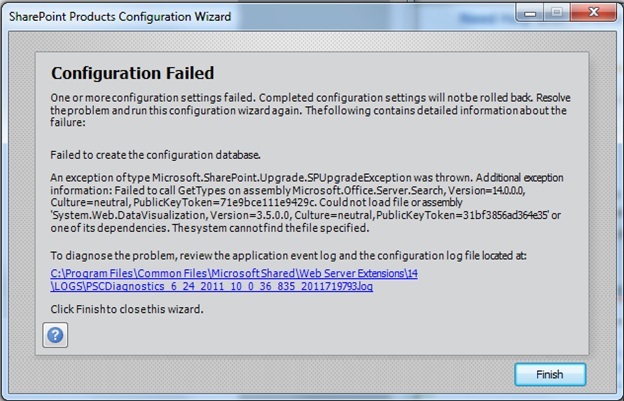 Additional exception information: Failed to call GetTypes on assembly Microsoft.Office.Server.Search, Version=14.0.0.0, Culture=neutral, PublicKeyToken=71e9bce111e9429c. Could not load file or assembly ‘System.Web.DataVisualition, Version=3.5.0.0, Culture=neutral, PublicKeyToken=31bf3856ad364e35’ or one of its dependencies. 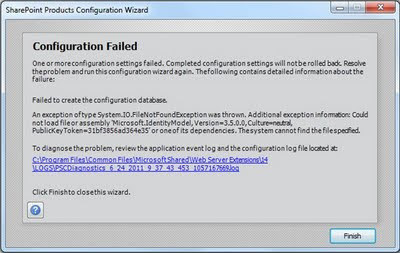 The system cannot find the file specified. Here the problem is that the Chart Controls cannot be found on the machine. Chart Controls can be downloaded from here. Thanks. It helped me while Configuring.